Re: EVENTS - Anxpina Hi-Fi show is a Go! I have not been present on the forum much lately. This is due to running into a medical problem that resulted in prostate surgery and complications. I am out of the woods and good enough to do the show m, with a rest here and there, but was only released from the hospital two days ago. Fredrik and I are at Axpona and had a very productive day getting the system tuned. I think it is fair to say that we are both pretty geeked about the music we are hearing. Once the system was grooved we took turns playing familiar music for each other that somehow we had never heard before. This system reveals levels of musical information and enjoyment unlike anything in my experience. Nuff said. A retro looking system sounding great. Have a nice show Thomas and Fredrik! Glad to hear you are on the mend Thomas. System promises to be a musical revaluation, I can imagine the Singularities peeling back layers of music and being reproduced by the electrostatics. Excellent speaker choice. Would really like to hear the Singularity in the UK if the opportunity comes along. All the best at Axpona, Tom and Fredrik. First day of Axpona has come to end and now I am knackered, as the British would put it. Perhaps partly due to the jet lag. A more or less constant stream of visitors visited us and some were really moved by the music and fully understood what we're trying to do - to impress with the emotional qualities and the deep insight into the music, not show fireworks. Those encounters are always particularly rewarding. I hope that you both can recover a bit as it looks like it's going to be a very busy venue. With all the hard work done I have no doubt SINGularity will sound better than ever. Saturday was even better than Friday. Even more people through the door, most of whom stayed longer to listen and some visitors from Friday that returned and brought vinyl they wanted to experience and share with us. Several LP12 owners said we were probably the only exhibitor with this extraordinary turntable. Surprising, given the huge number of rooms. Thomas excelled as always, sharing wisdom of turntable and system setup. "Are the speakers for sale?" "Not these, they're my own original 1958 vintage, non-refurbished pair of Quad ESL's." "1958?? How can they sound so good? Best I've heard all day!" "It's due to the signal we feed them with." Good to hear you're on the mend Thomas. Glad the show was a success too. 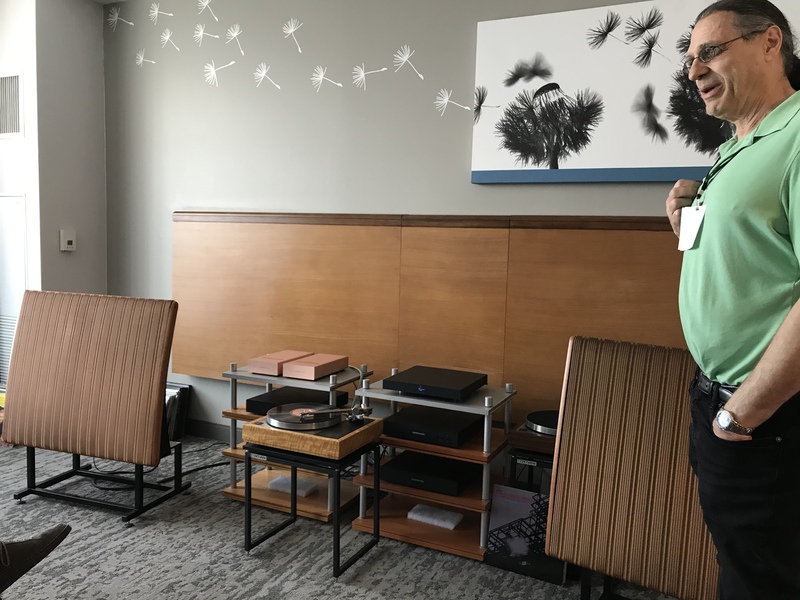 "But to see and hear an original pair dating from 1958 in the room shared by Michigan dealer/manufacturer Nokturne Audio and Lejonklou HiFi from Sweden was a highlight of the 2019 AXPONA." Pretty high praise from John Atkinson! Also good news to hear Thomas is recovering and doing well. Hello all and thanks for the good wishes. (Although my healing might have taken a step back after tokenbrit's attempt at humor. I'm thinking some reCumpense might be in order.) I hope I will be at 100% efficiency for the next show we do. Anyway, we did have a quite good show, with lots of interest in the system. Half of the people knew the Quads and were glad to see them, those in the know where quite surprised that a 61 year old pair with original panels and crossovers could sound that good. Many positive comments on the sound and look of them, some current or previous owners saying they had never heard Quads sound that musical before. Imagine that! Cue system hierarchy discussion. A fair number of people telling us we were making the most musical sound at the show, including some industry people. Then again we had arguable the most iconic turntable and speakers in the world connected together with Fredrik's wonderfully musical electronics. The SINGularity are truly even more stunning musically than they are visually, which is saying something. The connection with the performers through this system is unlike anything in my experience. Even some hardened industry vets told me it made the show for them. We disappointed some people by closing up early Sunday, and I apologize for that. But seeing as Fredrik had to leave at 1:00 for his flight back, and Chicago was covered with a heavy blanket of snow with more coming down, I made the decision to close up as 1:00 as well so that I wouldn't be getting back home and unloading the van after midnight. I was glad I did as we got to the house at a more reasonable time and I wasn't so wiped out. As usual, Fredrik was a ball of energy and charmed everybody he talked to. His enthusiasm for the music and understanding of what lets a Hi-Fi make music are always evident. The Stereophile write up was a surprise as I didn't even realize John Atkinson was in the room. I don't think Axpona uses different color tags for the press as RMAF does, or maybe they just hid them. I'm glad to see we made people happy with the music, that's what it is all about. So our first experience with Axpona was a very good one, and the first showing of the production SINGularity was a great success. I'm sure the first of many. Anyway, we did have a quite good show, with lots of interest in the system. So our first experience with Axpona was a very good one, and the first showing of the production SINGularity was a great success. I'm sure the first of many. Mea Culpa but glad everything (else) went well. Congrats & a continued, unbroken recovery. Here’s another write up on our room at Axpona with a good photo of Fredrik and the system.